Emma has a supersweet, superstar secret—but can she keep it from the Cupcake Club? Hollywood star Romaine Ford is back in town, and she needs cupcakes for her movie premiere...and her wedding! But everything is top-secret. 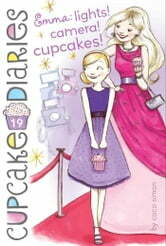 Emma is asked to make the cupcakes, but she can’t tell the rest of the club who they are for! Romaine doesn’t want any paparazzi to ruin her wedding, and she feels the less people who know, the better. Can Emma fulfill this order without spilling the secret to her best friends? Libros relacionados con Emma: Lights! Camera! Cupcakes!